In the leftmost column is the type of transit (in this case, a sextile), then there are three columns which correspond to the three orb values: outer, middle and inner. The date in the first of these three columns is the date at which the transit (relative to the outer orb value) forms. The dates in the second and third columns are the dates at which the transit occurs relative to the middle and inner orb values. The middle column gives the date of the exact aspect. Then there are three columns which give the dates at which the transit lapses, relative to the three orb values. At right is the exact time that the aspect becomes exact. Thus this table tells us that on April 5, 2017 (at 4:57 GMT), Venus and Saturn form an exact sextile (60°) aspect, that they are within 2° of that exact aspect from April 3 through April 6, and are within 5° of that exact aspect from April 2 through April 8. On April 17 these two planets come within 10° of an exactl semisextile (30°) aspect, which condition lasts until April 20, the exact sextile being attained on April 24 (at 6:38 GMT). Thereafter they enter into a conjunct aspect, and are within 10° of exact conjunction from May 7 until May 19, becoming exactly conjunct on May 13 (at 12:10 GMT). Venus, which moves faster than Saturn, then continues past Saturn to form another semisextile aspect, which is exact on June 1 (at 20:01 GMT). 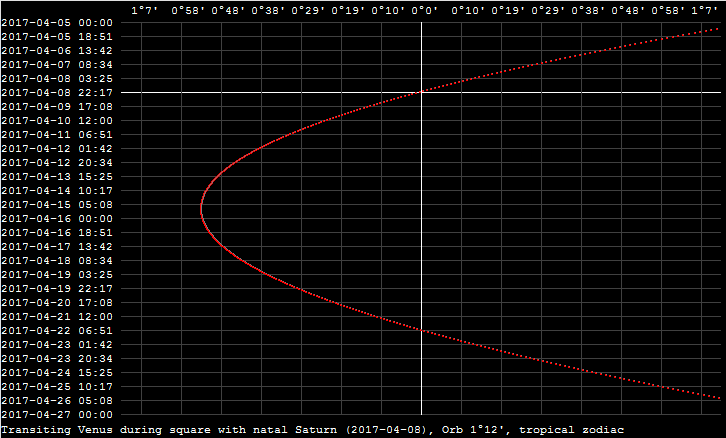 Cleary the geocentric Venus-Saturn transits in this period are not regular, as the heliocentric transits are. Due to the fact that in geocentric astrology a planet may become retrograde, it may happen that two planets form an outer orb aspect but the aspect never reaches the middle orb value, in which case there are no dates given in the second and third of those three columns. This table tells us that on Aprl 3 Venus and Saturn begin to be within 2° of an exact square aspect, which is attained on April 8 (at 20:27 GMT), with Venus being retrograde. It then turns and moves forward, forming another exact square aspect on April 21 (at 11:06 GMT). It continues to move beyond Saturn, exceeding 2° from exact square aspect on April 27, then exceeding 5° on May 3, and exceeding 10° on May 10 (at which time the angle between Venus and Saturn is 90° + 10° = 100°). On May 22 Venus comes within 10° of an exact trine aspect with Saturn, and this exact trine is attained on June 1 (at 15:23 GMT). Venus moves on and exceeds 5° from exact trine aspect on June 6. The progress of the square transit is shown in the following graphic. Here we see the retrograde Venus forming an exact square aspect with Saturn, turning forward on April 15 and forming another exact square with Saturn.